Inside 3 weeks and I cannot keep still. The anticipation is just killing me. I have a few thousand things to do before I leave but those will be in my rear view mirror in short order. A few days ago, Alan Arnette asked me if I would like to be interviewed and I readily jumped at the opportunity. Alan chronicles Everest climbing every year and offers readers wonderful insights into the ground-level happenings on both sides. Aside from being a climber himself, he is also a delightful guy. We met several times in Kathmandu over the past few years and I always enjoyed chatting with him. Needless to say, I felt incredibly grateful that he would have any interest in me or my climb. If you are curious about his website, I encourage you to explore it. Also, feel free to donate to his cause for Alzheimer's research; he takes nothing from the donations and gives back to the world ten times over. I rely on my X-Bionic base layer top for warmth and recovery. 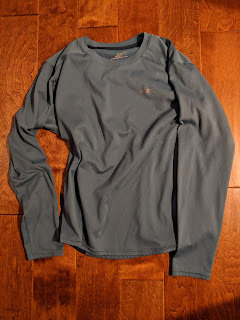 This base layer is really tight but made of some stretchy wool - similar to most Merino wool tops but way warmer. I wear this for days on end against my skin without fainting from the smell. No kidding! These tops resist getting smelly. Brendan will thank me for wearing this instead of some technical shirt. 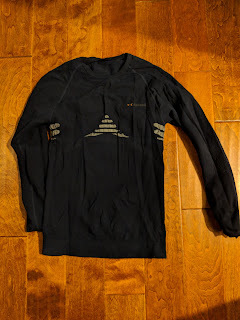 Speaking of technical shirts, I do wear one every day but mostly when I am in my tent. These "tech" shirts get really smelly in a hurry. I wear them to give my warm base layers a break and let them air out. Also, I tend to run warm so wearing a short-sleeved shirt in the tent suits my internal body temperature. 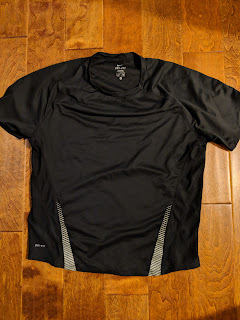 I often bring about 5 or 6 of these tech shirts because they are light, take up no space when compressed, and get smelly quickly so they need to be either recycled or discarded in my bag of stinky clothing. 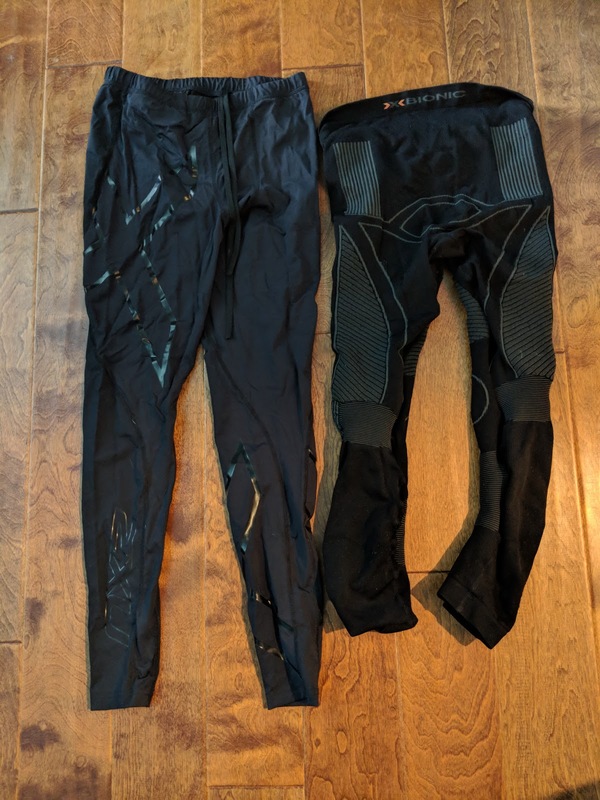 I also wear them every day so I need to have a few changes while I climb. Many days when the temperature reaches 30F (2C) or higher, I wear these shirts and a light top so they are quite versatile. I typically wear one fleece on and off throughout every expedition. My fleece is really light - equivalent to a sweatshirt but much warmer when wet. I also wear a long-sleeved tech shirt as a mid-layer over my base layer to just add another layer of warmth. The tech shirt is something like the one pictured to the right. Nothing fancy but it fits the bill nicely when I need just a little more warmth without any additional weight. 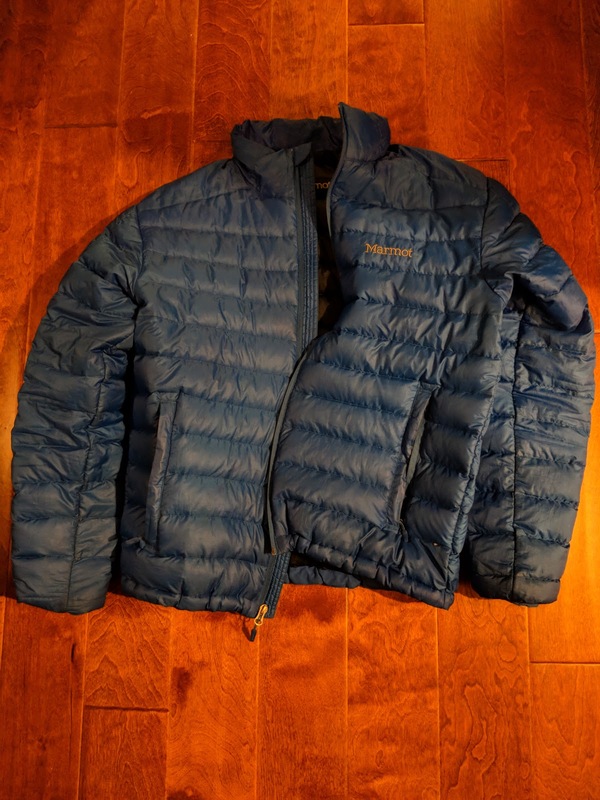 I also wear a puff down jacket as a mid-layer under my hard shell top. My puff jacket has no hood but is warm and light. 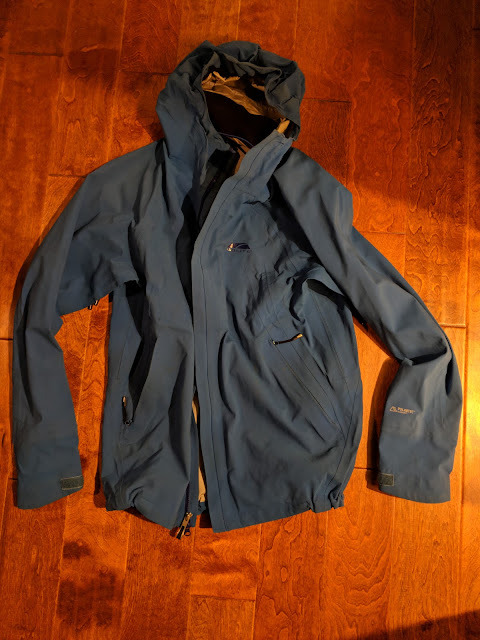 Once wet, however, a puff jacket is useless so I try to use it only when I know I will either not sweat much or there is no chance of rain. On Everest, the likelihood of rain is remote at basecamp or above; below basecamp, however, rain can be a problem. Finally, we get to the most outer layer covering my torso. I rely heavily on my big parka. This jacket is so warm it can keep me toasty in the coldest temperatures. 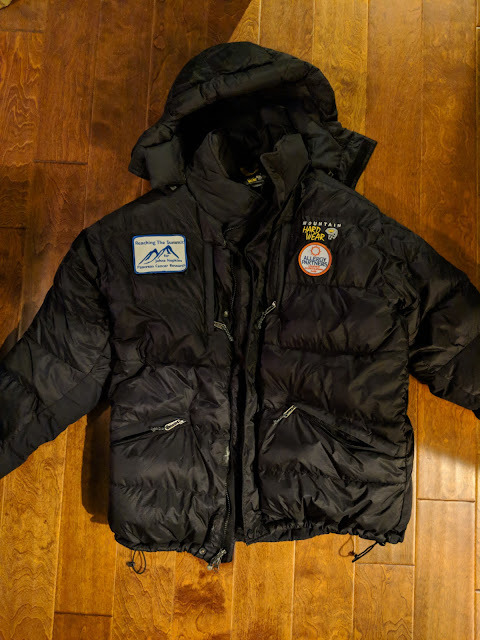 I wear this as soon as I get into camp after climbing all day, crawl under it when I sleep on cold nights, and lounge around in it at basecamp when I get a chill. Think of it as a sleeping bag with arms - not quite the coverage as my summit suit but it covers my torso and head nicely. The other article I rely upon when climbing - almost daily - is my hard shell top. I purchased this top almost 8 years ago and patched it, resealed it, and tortured it for that entire duration. When I climb, I typically wear only the bare necessities under this top. 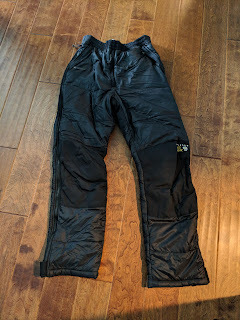 I find a tighter, wind-stopping outer layer allows me to stay warm while I climb. Stopping for long periods requires more insulation so if you plan to climb with minimal layers, keep moving! 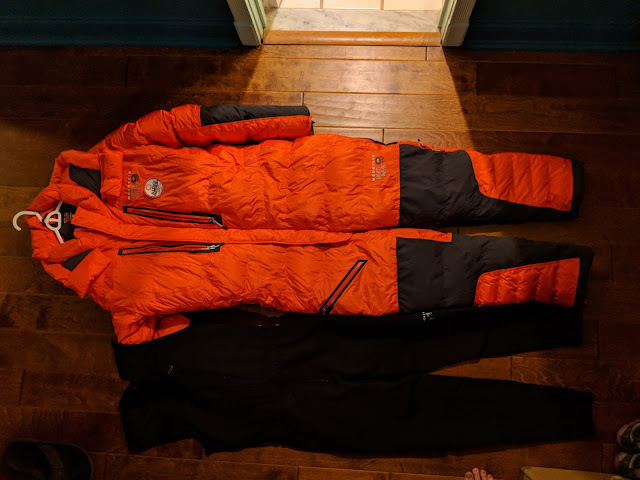 These are the few items I intend to take on my upcoming Everest expedition to cover my torso. Most of my choices come from many years sorting through gear that I found both useful and necessary. 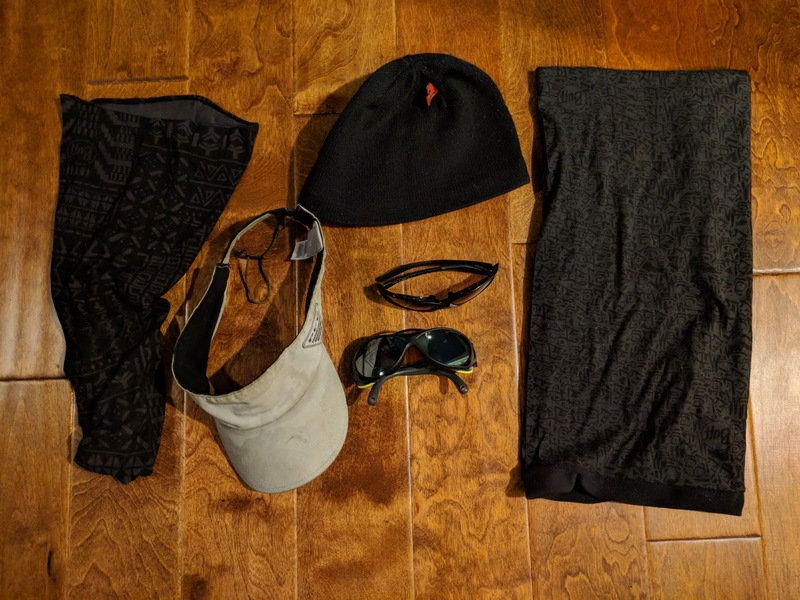 Each of these items fit those criteria and can be used under the conditions I expect to encounter on Everest this year. I have two more areas of my body to cover - well, three. Over the next few days, I intend to cobble together more pictures of my head and hand wear. My final post on gear includes those articles that cover my entire body. There are not many articles of clothing that do that job but there is one in particular that I rely upon heavily for summit day. So stay tuned for more gear. Thanks for following and a huge thanks to Alan Arnette for interviewing me for his blog. 1. Getting sick again. Over the past few days, I came down with another ear/sinus infection so that I have that wonderful experience - sleeping in a hypoxic tent with a clogged head and a blasting headache. Oh the fun! 2. Climbing plans remain unsettled. We are still working on getting Brendan's Tibet visa; mine apparently has not run into any problems (I hope). Brendan works in China and apparently he must give up his Chinese work visa if he obtains his Tibet climbing visa in Kathmandu. Yeah, I know, it sounds very odd but nothing is surprising when it comes to Everest. Every little problem just costs a little extra - often US$1000 here and there to make things right. Brendan and I still have no firm plans on how to meet in Tibet before we climb. We might just end up meeting at Advanced Base Camp after about 2 weeks of climbing. I sure hope not. My preference would be to meet way earlier - perhaps in Kathmandu - and enjoy the entire experience together. Regardless, these hiccups are hardly a major concern. We just need to sort them out. 3. Recovering means NOT training. I reached a point where my body and brain said ENOUGH! My body and mind are ready to climb and more training will only serve to make me sick or lead me to lose more weight (more on that point later). I am at a perfect climbing weight (176 lbs or 80 kg) and I do not want to lose any more weight. Recovery entails weight training, running, and some additional weight training using a weight vest on the elliptical. I don't plan to workout any longer than 2 hours each day and most days will be easy - around 90 minutes. That workout time includes stretching, breathing, and warming up so don't think I am going crazy here. 4. Last second purchases are done! There are always little things that I need to purchase at the last second. 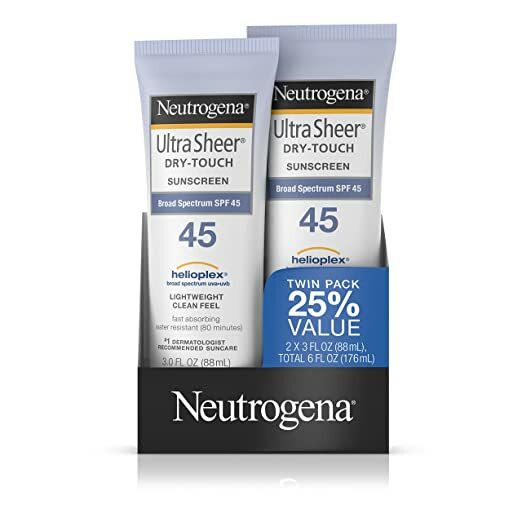 The timing often is important because what I purchase expires (e.g., sunscreen) or I don't know I need it until I finalize my packing. 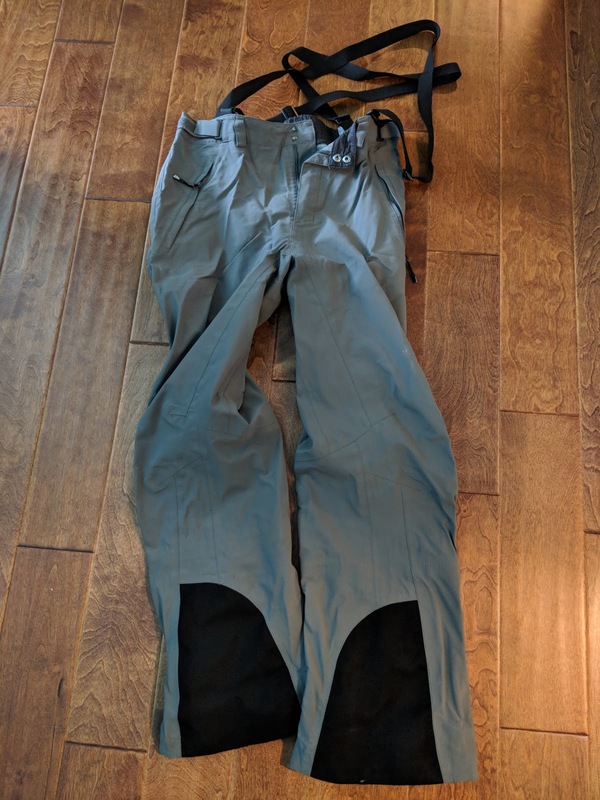 Based upon a rather thorough gear sort, I purchased the final pieces to my entire climbing kit. I checked and re-checked all my gear to ensure it is in fully functional order. I'm ready to pack...but not so fast. 5. Communications still need to be sorted out. I plan to use a Garmin InReach for communications while we are climbing. The InReach is quite a nifty device. I can send texts and updates along with links to a map where you can locate us. The only problem with technology is that you need to set it all up at home before you depart or else it simply will not work. I think there must be some rendition of Murphy's Law that governs the operation of technology but the only way to prevent mishaps is to get things sorted out. 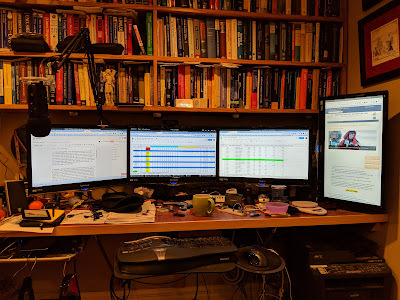 Over the next few weeks, I plan to post several "tests" that you can either ignore or become familiar with the system while I familiarize myself with it. Every day (weather and time permitting), I plan to send a message indicating where we are and how we are doing. Usually, these will be in the form of a map link and a simple "Doing fine, will send a more elaborate update when possible" message. Expect these tests to start in the next few days. I finally have pictures of all my gear so once I get the time I intend to piece together my gear sort - resuming with my legs and working up my body. Thanks for following. Hope you are enjoying the beginning of a fine week. Expect another update in a few days. 1. 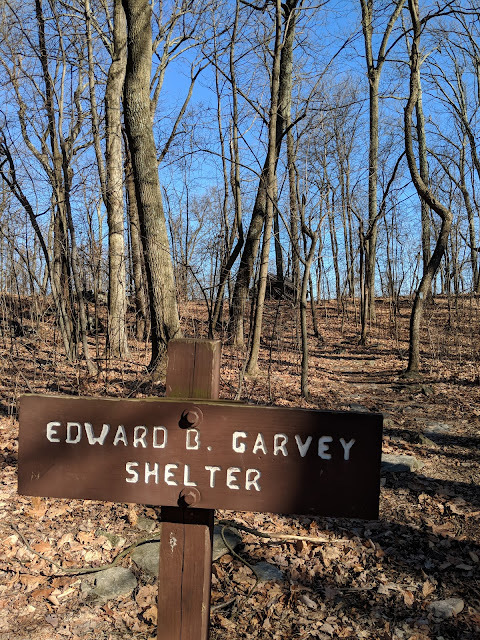 Weverton to Gathland State Park (out and back). I started from the parking lot in Harper's Ferry for a total round-trip of just a shade under 20 miles. The terrain was flat initially and then offered a nice climb up about 1200 feet then continued along an undulating ridge. Nice hike and certainly worth the effort and drive. An AT shelter in the distance. 2. 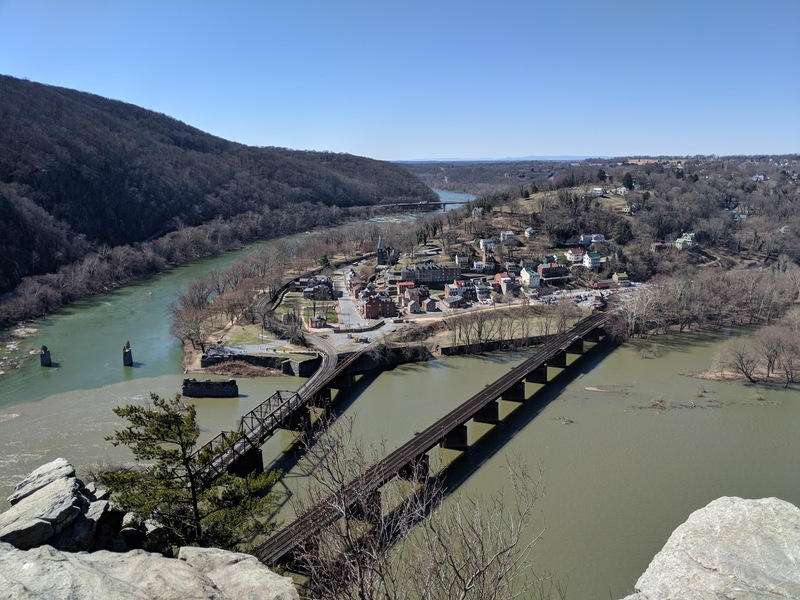 Maryland Heights Loop (loop with great views). I hiked this loop fairly quickly and enjoyed the scenery. The view from above. Little, charming Harper's Ferry down below. Thanks for following. More gear on Thursday. My last post focused on my feet. Today, or rather two days ago I intended to shift my attention just north to my legs. That intention was met with reality. Several things at work and some tough days of training kept me from taking pictures of my gear. I promise to return to the gear posts on Thursday (6 days from now). Yeah, I know I am out of sync with these posts. Just trying to fit in as much as possible in the little time I have left at home. 1. Working (Having Fun). I have four graduate students who are steadily progressing through their doctoral work. Along with guiding them, I have several projects that occupy my days - perhaps too many projects that occupy too much time but I love the daily challenge. Leaving for Nepal (and Tibet) in early April requires me to get caught up on all of these work projects well before I depart. These projects also provide me with endless ideas about what to post on my Psychology Today Blog. Work is fun. Actually, I often say I never worked a day in my life. With the exception of those days filled with meetings, I can honestly say I rarely work; I have fun. Hard at work....in my own sloppy way. 2. Training. I train most days for 3 hours except for rest days when I only train for about 1.5 hours. The indoor training routine is starting to drag me down a bit. I know I need to press through but I just cannot get enthused about training. Perhaps this is a good sign that I am ready? I don't know, but mentally I am ready to go. Based upon my schedule, I have 17 more "hard" days of training before I begin my recovery period. Those days will be difficult but I enjoy the challenge; I just wish I could get more pumped up for the sessions now. Each day begins with some light warm-up exercises, core work, lifting, running, and then more cardio with my pack. I wish I could just put on my pack and go climb. Soon.....oh so soon. 3. Sleeping (barely). Hypoxic sleep training starts off really fun/exciting and then progresses toward work - yes, work and I mean work. 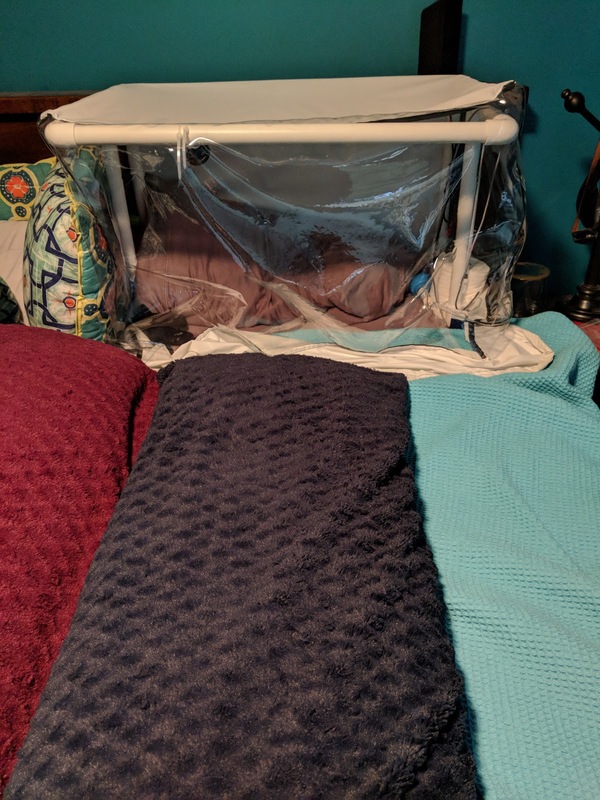 Today, I woke up at 8.7% oxygen in my head tent. What does that percentage mean? I had about 42% of the oxygen that most of you had this morning. That oxygen level is roughly equivalent to the summit of Aconcagua (23,000 feet or 7000 m). Even typing that gives me chills. I had tons of fun climbing Aconcagua with my friend Brendan. He and I will be your tour guides this spring on Everest so stay tuned for an introduction. For now, I struggle to sleep through the night. I wake up almost every night at 2am after going to sleep at roughly 9pm. From 2am until about 4am, I think about things to do. After 4am, I may drift back to sleep but more often I just get up and grab a cup of tea. For those of you more interested in my acclimatization, my spO2 ranges from about 65% to 78% on most mornings. All in all, I feel great in the morning (perhaps less so this morning) and feel great while training. 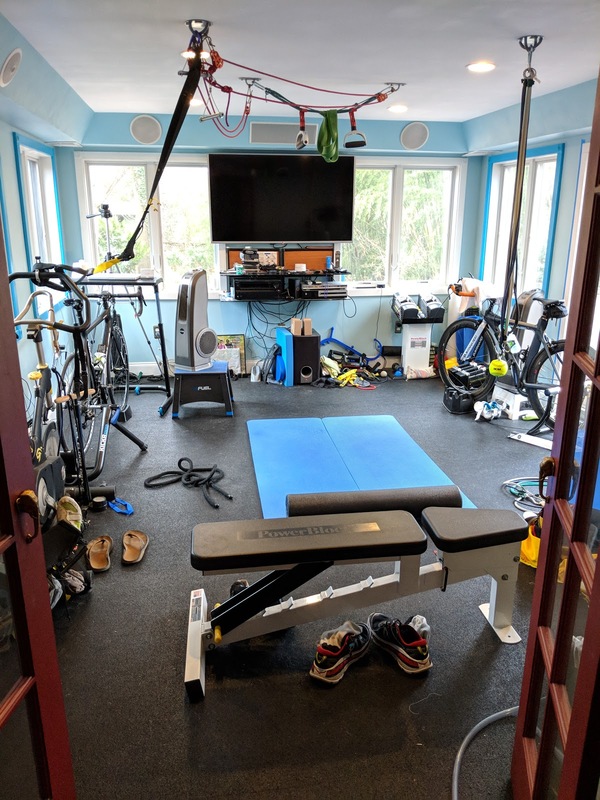 Getting started with my training routine early is likely affected by my hypoxic sleeping (if you want to call it sleeping). 4. Preparing. The last few weeks before departing on any expedition tend to be the most hectic. Everyone wants things from me and I only have about 15 hours each day to devote to these life activities. 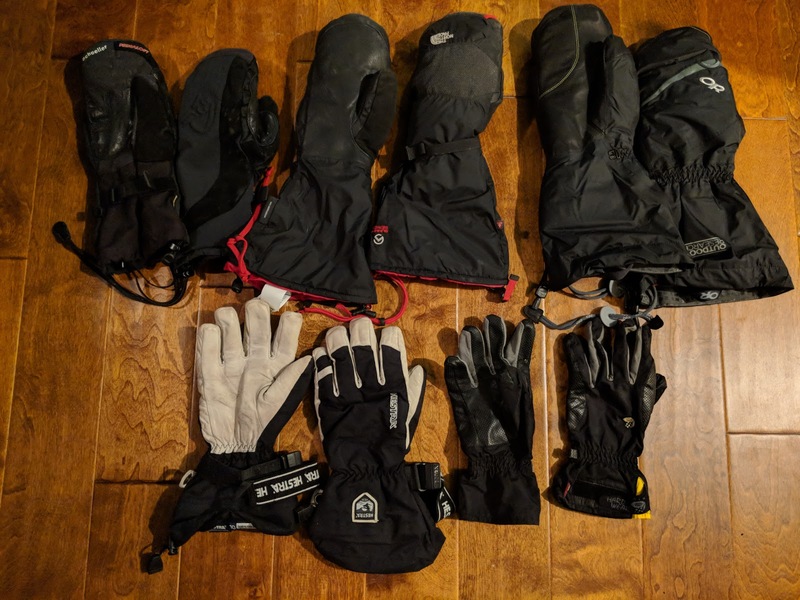 Part of the preparation is packing, sorting through gear, checking each piece for integrity, and organizing lists upon lists to reduce the cognitive burden while I am climbing. These preparations take time. I am also ordering last-second consumables (e.g., sunscreen, body wipes, and such). Taking stock of what I have and what I need is a full-time job that needs to fit into what remains of my day after I sleep, work, and train. To add a little intrigue into the mix, I also have to prepare to collect data while on Everest. I didn't mention this before but will explain the rationale in a future post. So climbing and working preparations occupy my "spare" time when I am not working, training, or sleeping. You might ask yourself, when do I eat? I eat on the run. I eat when I can. I eat when I need to eat. More on that later - I promise. This morning, I woke up at 176 lbs (80 kg) down from 198 lbs (90 kg). I am eating...again, I promise. Between training, working, and sleeping, I can only eat so many calories to offset the weight loss. Heck, I had a few pounds to spare anyway. My weight is no concern right now. Finally, I am able to run without feeling the pounding through my knees. 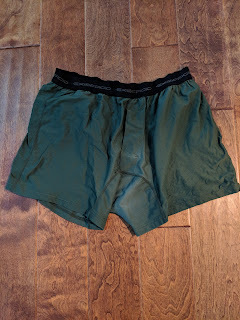 My next post - probably on Thursday (March 8th, 2018 - 31 days remaining) - focuses on my leg gear. After that post, I should be in the clear to post more regularly on both gear and last-second preparations/announcements.